As the Holiday season quickly approaches, so does the traditional Palatine Park District/Lavelle Law Turkey Trot! The 37th annual event will take place on Thanksgiving morning, Thursday, November 23 at Harper College, 1100 Algonquin Road, Palatine. 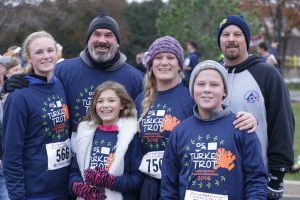 Turkey Trot includes a 2 mile run at 8:00am, a 5 mile run at 9:00am, and a drumstick dash for children up to age 10 starting at 10:00am. All participants who are pre-registered by November 16 at 7:00pm will receive a complimentary long sleeve dri-fit shirt. Goody bags full of information and products from the event sponsors will be given to the first 2,000 registered runners. Between the races, the District will raffle off pumpkin pies to 10 lucky participants. All runners will receive medals. The top male and female finisher in each age group per race will receive a special medal. Pre-race entry fee is $25.00 and the fee is $30.00 on the day of the race. Participants registering after the November 16 deadline will be charged the day of race entry fee. Groups of six runners or more can register for only $20.00 per runner, however, registration must be completed by the pre-registration deadline. Registration for groups is not available online and must be completed in person at Birchwood Recreation Center, Community Center, or Falcon Park Recreation Center by November 16. On-site registrants will receive the shirt and goody bag if available on the day of the event at Harper College. Due to the renovation of Building M, this year’s race day registration, pumpkin pie raffles, and post-race refreshments will be in Building A. For a race map and additional event details, visit palatineparks.org. For those participants in the spirit of giving this Thanksgiving, Palatine Park District will be collected non-perishable food items for the Palatine Food Pantry on race day. Items can be donated in Building A near registration. This year’s Turkey Trot has been enhanced through partnerships with a variety of community businesses including presenting sponsor Lavelle Law, Ltd and the following gold level sponsors: AMITA Health, Andigo, Daily Herald Media Group, Great Clips, Harper College, MeritCorp Group LLC, Orthodontic Experts Ltd, Palatine Bank and Trust, and Palatine Vision Center. Post-race refreshments are provided by Jewel-Osco of Palatine on Plum Grove Road, KIND Snacks, Pepsico, and Photos Hotdogs. Registration can be done online, in person, by mail or by drop off at our community centers. Fees can be paid as individuals, as a family, or as a group. Bikes, baby joggers/strollers, roller blades, skateboards, and dogs are not permitted on the course. For more information, contact Health, Fitness, and Wellness Coordinator Abby Krueger at 847.496.6265 or akrueger@palatineparks.org.